My wife and I were having a lazy Sunday, not sure where to go, or what to do. We ended up at one of the larger malls not too far from where we live, and we decided to have a small snack in the middle of the afternoon. 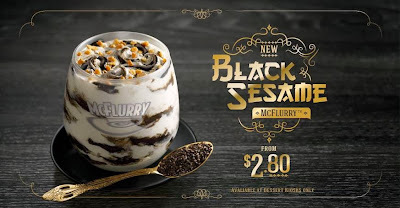 The Black Sesame McFlurry wasn't heavily promoted, and though it seemed to be a nice fit with the Ebi Burger (keeping with the Japanese theme), it was only being sold at the dessert kiosks, so only around 40% of branches in Singapore would be carrying these, since not all have the standalone dessert windows. 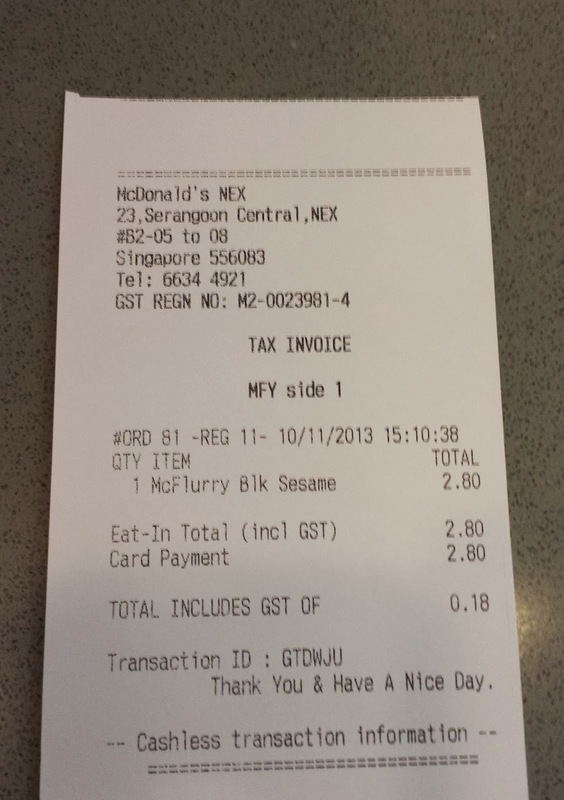 I was hoping that it would be similar to the recent Matcha McFlurry (which, even though they have this new promo, is still sticking around most branches I've passed) but as soon as I watched the woman make the McFlurry, I had a feeling I wasn't going to enjoy the flavour nearly as much as I did the Matcha McFlurry. 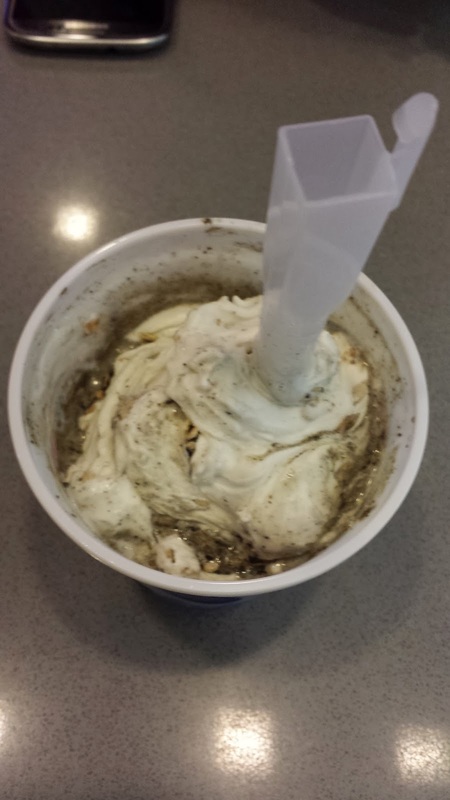 Whereas the Matcha was ice cream with pure green tea powder mixed in with the ice cream, and that's it, this McFlurry used a black sesame syrup, which, although you could tell there were actual black sesame pieces crushed in, it still didn't need to be added to a sugary syrup, the ice cream is sweet enough as it is. They also thought it would be a good idea to add a scoop of crunchy, rock hard corn flake pieces into the ice cream, something McDonald's in Singapore has done before, and I've never really enjoyed it, nor understood why anyone would want these in their ice cream. If they wanted to add some crunch, add nuts, it's not like they have to worry about nut allergies as often as western countries. 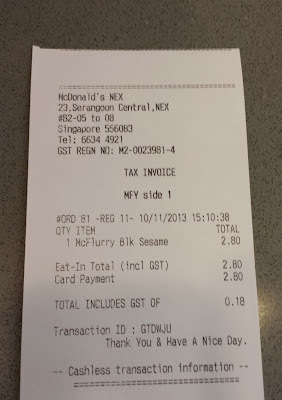 Since the sesame was diluted in a syrup, it barely had any flavour to it. 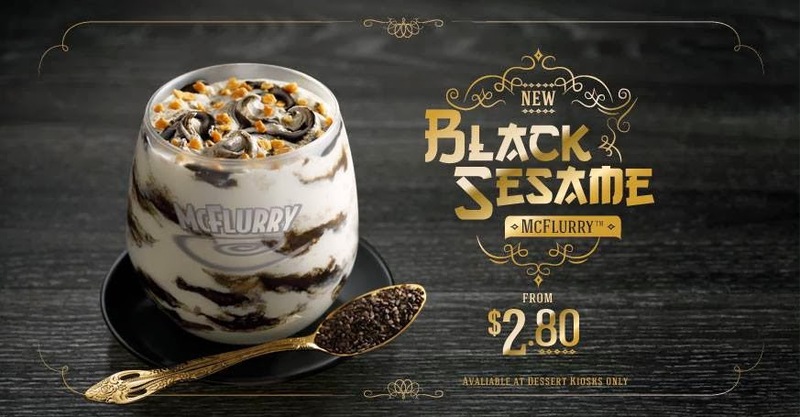 I have no idea why they just didn't add sesame right into the ice cream, it would have been healthier and more flavourful. They may have throught that the whole seasame seed would have been too chewy, but it would have been perfectly fine to have them crushed. 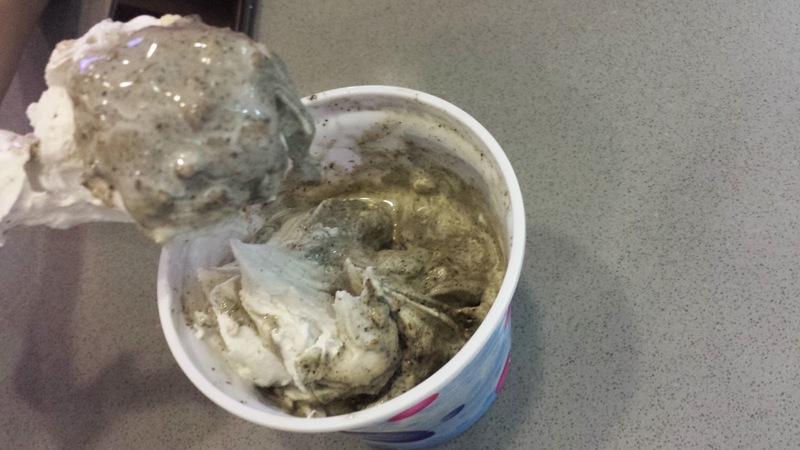 My wife liked the crunchy pieces, but I felt it would have been better as pure ice cream, the crunch was only added for texture, and didn't add any additional flavour to the ice cream. 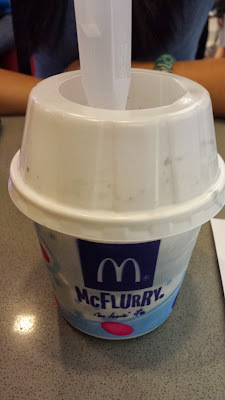 Oh, the McFlurrys are still $S2.80, which is vastly overpriced...I won't be getting it again, and I suggest you don't even bother trying it.